Designed to complement Deanta Internal Walnut Doors. Fold Walnut veneered Room Divider Door Frames are manufactured from engineered door components which can include MDF, particle-board and laminated timber. They are supplied with track and sliding/­folding door hangers - for internal domestic use. Doors need to be ordered separately and additionally to the Walnut Fold Door Frame & Track System. The Fold Walnut Door Frame Room Divider is only available when purchasing with Deanta Doors. 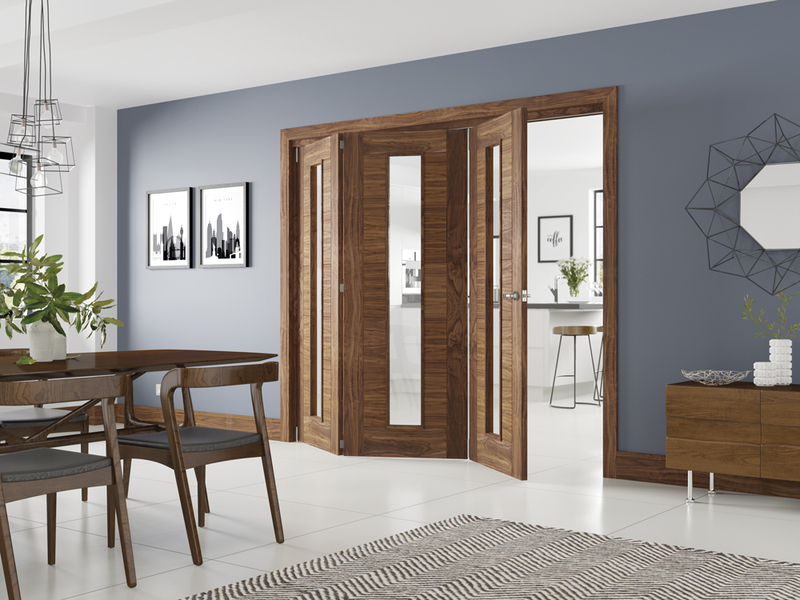 Whether you want to make one room into two, or two rooms into one the Freefold Folding Walnut Door System is your ideal choice of Room Divider. Deanta Fold Walnut Frames & Doors have a copy of the manufacturers instructions included in the packaging. - We cannot exchange Fold Walnut Door Frame Systems after order - Deanta Fold Walnut Door Frame Systems are supplied as a Special Order.